Makeup Specs Make Make Up A Breeze! 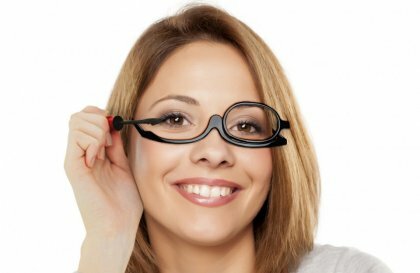 If you wear glasses to help with your close-up vision, then applying makeup can be a struggle. It’s either blurry guesswork or a cross between a balancing and juggling act, with makeup, brush, eyelashes and hand-held reading glasses all conspiring to make an already difficult job nigh-on impossible! These ingenious makeup specs have a single, hinged lens, which easily flips from side to side, giving unrestriced access to one eye, whilst allowing the other to see clearly how that mascara is coming along! Contact lens wearers will also be celebrating - at long last, a viable answer to that paradoxical question: “how do I see to put my contact lenses in when I’m not wearing my contact lenses?” A pair of these single-lens specs is the simple and affordable answer. Makeup specs are available in black or purple, and six strengths (dopiters), from +1.0 to +3.5, to cover the majority of long-sighted needs. If you're not sure which diopter you need, then why not try our free eye chart. Makeup specs are available at £7.99 from www.readingglasses.london. Shipping worldwide, with free postage and packaging within the UK.